Transformations, New Exhibitions and general chaos! Showing work is an important part of what we do. When people come to Space2Creare we want to celebrate the fantastic creative work they do be it through social media or in an exhibition. There are reasons for this. When you are struggling with low self esteem and confidence having the work you produce valued and on display is another small step to regaining that self respect. We also like to have a purpose behind our creativity. On that theme we have started the Transformations Project. This is aimed to link work by the Creative Writing Group to local artists. The writers are writing pieces on the theme of transformation and we will pass these to local artists who will then create a work of art based on it. An exhibition will follow later in the years. It has been a quiet week at S2C with half term holidays claiming many. We took the opportunity to start changing the exhibition in our gallery. This was good as we sold two more pictures as we were taking them down! Now we are working to get the new exhibition up which is the work of six Space2Create volunteers and service users with a wide range of media and styles. More information will appear soon in our exhibition section. This week we will also be putting up pictures at Kendal Leisure Centre, photographs selected from our photography group of Blackwell and the auction market. Photos will be on view at the Leisure Centre from 4th June. The 2Create group worked on a graphic for the upcoming Transformations Project while Chris worked on his wicker man sculpture. In the session the group transferred their drawn designs onto their previosly rolled out clay tile. They drew over the design with ballpoint pen to leave an impression in the clay. Then they painted out the design with a slip. Next we the group will repeat this process on their second tiles before adding more detail. the tiles are really starting to look amazing. A small group due to half term again but those of us there carried on to finish off projects. Mainly people worked on their Scottie Wilson inspired pieces or played with words. Emma worked more on her transformations piece. After some free writing to warm up the group tried a writing starter where words and sentences were taken from an article. These were then arranged to create a poem. This worked very well and produced some interesting results. The group then carried on working on pieces for the Transformations project. We produced a lot of work in today’s session, after few warm up exercises bending letters, we continued the theme of graffiti by building letter forms and adding decorations like strokes & fills, drop shadows and different colourways to emphasise the graphic styles. The group began to experiment within their own chosen mediums, with illustration, comic art, acrylic paints and even needlecraft being used to create a wide range of styles. The WellArt Group had a great visit to the Abbot Hall today to look at the Portraits exhibition. A wide variety of styles and artists in the collection so something for everyone. Some of it quite challenging. Many thanks to Anne-Marie for showing us round and being so informative. Inspiring stuff! A New Mayor, an exciting collaboration opportunity and Scottie Wilson fever! I was very pleased to attend the Mayor Making this week at Kendal Town Hall of our good friend Chris Hogg. He is a great supporter of the work done by Space2Create and indeed of arts for health. He had some good things to say about us in his first speech, great publicity for a small charity like ours. This week also saw us launch a new collaboration project. We are asking local artists to collaborate with members of our writing group. The writing group are currently working on poems and prose based on the theme of “transformation”. These will then be given to participating artists to hopefully produce a piece of art based on the writing. These will be exhibited later in the year and then auctioned of with proceeds going to Space2Create. The rest of the week seems mainly to have been based on the outsider artists Scottie Wilson, with many of our groups producing work based on his. It is such a simple process yet the actual crating of them reminds me very much of zentangles which have such a focus on mindfulness. This was also the last week of our current exhibition so we are now taking down and preparing to put up the next one ready to open on June 6th. The WellArt group were finishing of the Scottie Wilson inspired images. Dana was working on a piece of her own. Those who had done started to look at interesting ways to Scottify text by overlapping it and drawing just the overall outline. Combined with the painting and pen effect these looked great. The Thursday group turned to painting the clay models they made previosly. These look really effective and with a coat of varnish will be put outside in peoples gardens. On the ward this week the group continued the theme of Scottie Wilson! The group had the usual warm up of free writing but then started laying the foundations for a very interesting project. The writing group is planning to produce a body of work that incorporates a theme of transformations, working together to make changes. This will be in a range of styles, be individual and collaborative. We hope to invite members of the other Space2Create groups to then create images based on the poems, we are also hoping other local artists might be involved. We started working on a piece today but they are all very much in draft form at the moment. Today the 2Create looked to Scottie Wilson for inspiration. An outsider artist who created amazing complex patterns and fantastocal images. We took as our starting point one or two real life creatures or plants and merged them to create a new fantasy creation. Starting by drawing the outline then breaking it up into sections which we filled with watercolours so that no two agacent blocks were coloured the same. This outline we then inked over and filled in the sections with small repeating patterns. This looks very unusual and effective. Ant produced an optical illusion of a skull. The group finished combining our initial designs for our tiles with the “Yellow Wallpaper” motif. This step is necessary so that we can transfer these complete images to our still damp tiles. We shaded the patterned areas to be covered in yellow slip and added our drawings and collage elements. It felt very calming to basically “colour in” the wallpaper pattern element in each of our tile pictures. Conversation and creativity go together to bring Wellbeing. One thing that has always been clear to those of us who have been involved in arts and health projects, both on the receiving and leading side, is the way that being creative together results in such a positive atmosphere. So many different dynamics open up between the participants. People start nervous and subdued, uncertain about being there and anxious about any one talking to them. Then they find thay have common ground in the artwork. At first talk is about the creative project but slowly people relax and open up. As sessions go on people are talking openly and humour emerges as people start to laugh and support each other. Help is given to each other. By the end of a session, where the expressions were down, they are now smiling and relaxed. A really enjoyable session this morning saw the group look at doing some surreal collage. This involved simply combining a few images to alter the reality being shown. We tried looking for a background and keeping it simple by only adding a few more images but trying to be careful in selecting images that worked we in comination. Some interesting results were achieved. The group lookd at making simple pots. This was done by rolling out a rectangle of clay. This was then rolled to form a tube. We looked at joining clay by crossing the surface and using a slip to act like a glue. They then rolled out more clay, sat the tube on top and drew rouns it to get the base diameter and stuck the bottom on using the criss cross and slip method. After this the group added or changed the shape of their pots to how thery wanted them. Another great creative writing session today with Maggie How. After a little free writing the group focused on haiku poems and looked at the structure and methods of composing them. Each is three lines with a total of 17 syllables in the form of 5,7,5 syllables to a line. Using sheets of tracing paper, we worked on a series of transparent surfaces, which were set as layers, and mounted onto the windows, to take advantage of a very sunny day, and let the light filter through the different layers, adding depth, detail and more blurred images in the background. We used a mix of paint, pencil, pen, letraset and found objects such as grass and plants, we quickly created a range of different styles of graphic art with a slightly 3D effect. In this session the clay theme continued as it is so adaptable allowing individuals to create pieces meaningful to them. Some people made 3D pieces whilst others rolled out the clay and added to a flat design, building it up. Others in the session worked on bracelets, drawings and comic art. Today the group had a go at designing symbols to enter an Ordinance Survey competition. They are looking for designs of ten symbols to add to maps. The symbols were he blue ones that show places of interest. They wanted symbols for things like ice rinks, skateboard parks, car char check ing points, solar farms and others. We sketched in pencil first looking to simplify designs as much as possible. Then they were drawn out in blue ready to send off. All designs top secret! 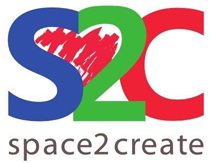 Space2Create, as a completely voluntary Charity, has no paid staff. Everything from the organisation, the management, running sessions, cleaning, fundraising to setting up exhibitions is done by volunteers and service users. This also means we are independent and we can truly say that we work for the benefit of those who come to our groups. We place no restrictions on who attends. If you have any kind of mental or physical condition that means you are low and socially isolated, Space2Create is a safe and welcoming place that can help improve your mood and get you back to moving forward in a positive way. If you have something to offer or just want to help others in a positive way then I can strongly recommend volunteering with any local organisation. We are all looking for volunteers to help us create a better life for people who are struggling. This week has been another creative one with lots of great creative work being done. One of the highlights this week was the Creative Writing which once again produced loads of ideas and imaginative work. This was a quiet session as most of the group were off at Blackwell doing the Ceramic Project. Those left behind had a go with oil pastels and were busy prepping photographs ready to go on show at the Liesure centre. Working again with Ceramic artist Emilie Taylor at Blackwell the group talked about different images and how the group could develop them to use when creating ceramic tiles. Later the group rolled out two pieces of clay that will then be decorated and drawn onto during the following weeks. The group had a go at two things. Those who had lanterns to finish carried on with these and added some bling! The rest explored chalk and oil pastels. First by having a play to see what they came up with. Then we created some pictures and landscapes. We had another really good session with Maggie How doing Creative Writing. There is a very good creative feel now to the group. Everyone is welcome to join in. Today the group was wriing from starters given by Maggie. We also used images for inspiration and then had a go at group writing with each of us adding a line to a poem blind. The results were very funny. On those that looked to the sky. What was the great design? As to the reason why. With Giraffe appointed in splendour. And was remembered for many a decade. The Kentmere group considered mixed-media journals and booklets. Using old envelopes,found images , print blocks , watercolours , magazines and ideas we created highly individual mini books with a simple 2hole binding technique. A very relaxing and accessible session. The group used leather cord and embroidery thread to create bracelets for ourselves or as gifts. We used a series of half hitches with 3 -4 contrasting colour threads. Fastened with bright buttons, the patterns created with the thread were very eye catching. Most of us were able to finish our bracelets during the session which added to a sense of accomplishment. A really food session today working with clay to make something a little abstract or surreal. We looked at ways to construct the sculptures and how to use a slip and crossing the clay to join bits together. Some used plastecine instead! We talk a lot at Space2Create. One of the most important things in recovery from a mental health condition is being with people, being supported and being listened to. This week all our groups have had such a positive feel to them. People smiling and laughing. I have been told on three separate occasions by three different people who come to Space2Create how much it means to them and how big a part it plays in helping them. They feel safe, they feel supported, they feel wanted. Which is good. It’s how I feel about S2C as well and I run it! Today the group carried on looking at ways to use the sea worn glass we had collected. Today we used a mix of glue and acrylic paint to sit behind the glass and colour it. It was a small group as most had gone to Blackwell as part of a ceramic project. This 10 week project, a collaboration between Space2Create, Lakeland Arts Blackwell and ceramic artist Emilie Taylor began on Tuesday. The morning was spent discussing ideas around the story ” The Yellow Wallpaper” which will influence the finished ceramic pieces. The group then used pastels to quickly skeych designs and patterns that they found around Blackwell. After Lunch, Emily encouraged the group to redraw the mornings images, this time using a candle so they would be lessed obsessed with the detail. They then revealed the drawings by painting over the images with brown ink. The group is looking forward to next week. The group from Unity came and we worked on lanterns. The group was shown by Emma how to make the framework first and they all set to creating thier own. A few worked together. Then we looked at applying the tissue paper to form the outside. We ran out of time but we will be finishing them off next week and adding some bling! On Kentmere ward the group made morblled paper. We dropped watered down acrylic onto paper which we had placed into a salad spinner. We spun the paper quickly which created a marble effect.We then went on to draw on paper with candles and watercolour over it to reveal the pictures. A good Creative Writing session today with Maggie Howe. The group members were on good form with some stunning writing. We also discussed putting together a small book of images and writing to publish. If you would like to be involved then just come along on Wednesday Morning 10-12. We ask for a £2 donation towards costs. A tapering tower standing bereft. Stand and point accusingly at the architectural sky. With lingering gaze on the chaos below. Which, on reflection, I perceive as reality. From the picture “On Reflection” by De Bois. The group, under the guidance of Clare, continued from last week looking to finish their quilling pictures. One member of the group came equiped with the proper kit havingdone it before and was able to share some of their skills. The group was very productive and in good form with everyone leaving in great mood. The images are looking really colourful. This was a rally nice and relaxed session. The aim was to become a little more comfortable with using and blending oil or chalk pastels. We looked to produce images using stripes of bold colours that could be blended to merge the images. A lot of experimenting went on including washing ove the chalk pastels with a brush and water.